Lancaster City boss Phil Brown is targeting back-to-back cup victories. Lancaster City boss Phil Brown has challenged his players to kick on after a stop-start few weeks. Saturday’s 3-2 reverse at Grantham Town was the third in their last four Evo-Stik Premier Division games. The Dolly Blues bounced back however by getting the better of West Didsbury and Chorlton 2-1 on Tuesday night to reach the last eight of the Lancashire FA Challenge Trophy. Attentions turn to another cup competition on Saturday with Stratford Town the visitors to Giant Axe in the second qualifying round of the FA Trophy. “We’re getting to the situation where we’re looking for a bit more from the players,” said Brown, whose side are 13th in the table. “We’ve had 19 league games since promotion and should have adapted now. “I’m looking for us to progress. We can’t keep taking two steps forward and one step back. “We don’t want that step back. Of course we’re going to lose and draw games but we’re losing and drawing when we shouldn’t be. “Sometimes we’re getting nothing out of games we should be drawing, drawing games we should be winning and then winning games but it maybe should be by a goal or two more. “It’s my job to turn that around. “I’m still relatively happy with where we are. We’re midtable with games in hand. After seeing a 2-1 lead slip away at Grantham, Brown was pleased to see a much-changed side hit back in the LFA Trophy. Now the challenge is to build on that with £4,000 up for grabs for the winners this weekend, Stratford 19th in the Evo-Stik Southern Premier Division. “We just ran out of steam on Saturday,” said Brown. “We changed the team around for a variety of reasons on Tuesday night and got the right result. “It was important that the lads bounced back from the weekend and we did that. “It can be a springboard for another cup game on Saturday. “Hopefully it’s another win and we can pick up some welcome prize money and move into the next round. “It’s a winnable tie and we’re at home. Brown is having to juggle the pack when it comes to injuries with goalkeeper Chris Cheetham having returned at West Didsbury only to pick up a knee injury. Rob Henry, Gavin Clark, Glenn Steel, Tom Kilifin and Craig Carney have also all been on the treatment table. Josh Westwood did however return to the squad on Tuesday night after missing the last few weeks due to work commitments. One player has left the club this week with striker Oliver Wood returning to Colne. “Oli’s left for a mixture of reasons,” said Brown. “His playing opportunities have been limited in recent weeks and it’s been difficult with his work commitments and the travel. “We had a chat and have parted ways amicably. “He had a chance to go to Colne and I wasn’t going to stand in his way because I couldn’t guarantee how much he was going to play. “He’s a great lad who worked hard and got a few important goals. He was a great asset when he was with us. “It opens the door for someone else. 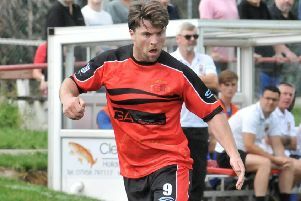 “We brought Elliot Pond into the squad on Tuesday night who has been doing well for the reserves.